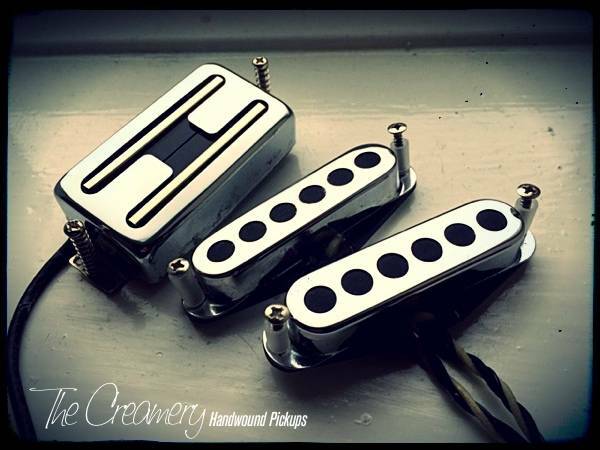 Custom Creamery replacement pickup sets for H-S-S (Humbucker Sized Bridge, Traditional Single Coil Strat Size Middle & Neck Neck) configuration for Stratocasters are direct drop in replacements. Featuring a choice of handwound Bridge Humbucker sized pickup and Middle & Neck Pickups from my Strat range, I make them as a custom calibrated sets for godo balance with no sudden volume jump/drop when switching through the positions. With standard Humbucker Pickups and Middle & Neck Single Coils often unbalanced, there can be sudden volume drops & jumps when switching from Bridge through Middle to Neck. I can make replacement H-S-S Strat Sets calibrated to offer much more even volume levels as you switch.. If you'd like specific or custom designs for the bridge humbucker either drop me an email to discuss the various options or simply leave me a note at the checkout stage letting me know which type you'd like.